The weather forecast says there’s a chance of rain for this Sunday’s Paris-Roubaix. It hasn’t rained during the race since 2002, a bizarre dry run given we associate the spring classics with grim weather. In these safety-concious times is it ok to dream of a wet edition? It rained during Paris-Roubaix in 2012 but only a few drops, enough to dampen the dust but no more. Instead we have to go back to 2002 for the last proper mud bath edition. It’s odd as Lille, the city next to the town of Roubaix, is equal 13th among Franc’s 118 cities for the number of rainy days a year meaning Roubaix and the surrounding area is one of the wettest regions of France. 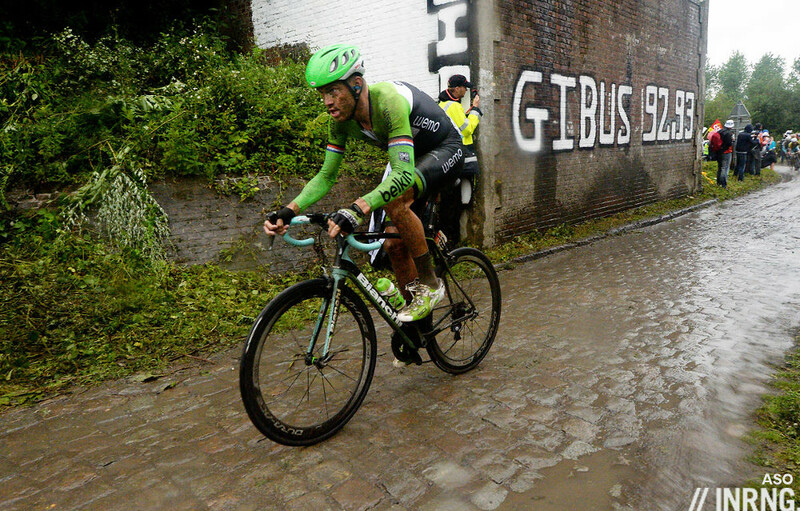 So why doesn’t it rain for Paris-Roubaix? It is just a statistical oddity, a fluke run? Partly but it’s explainable too. The chart above is from climatedata.eu and the blue vertical bars are precipitation, rain to you and me. 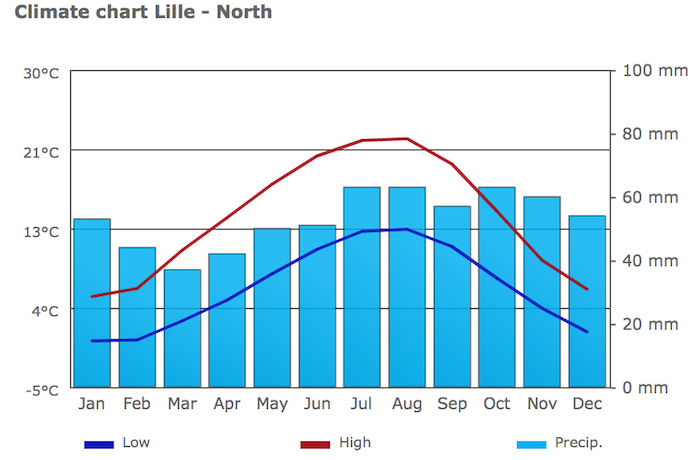 The driest time of the year? Turns out it’s March and April. Summer is wetter which helps explains why the wettest edition of the Paris-Roubaix was… the 2014 Tour de France which borrowed several of the cobbled sectors. There’s talk of skipping the first cobbled sector because of mud. Before you leap to the comments in outrage to post comments about this not happening in Bernard Hinault’s day, remember the course actually does change a lot from year to year and the conditions play a part in which sectors are included or not. The concern over the Troisvilles sector right now is because it’s got a downhill part and, as it runs down, it goes into a small dip between the fields with muddy embankments on either side. Here the soil has spread over the road leaving a good, thick coating of mud. The fear isn’t the mud itself but the whole bunch thundering into this spot at 60km/h and suddenly hitting the dirt. The rest of the course is muddy and wet in places but ridable in the traditional sense. There’s something hypocritical about fans, eager to settle into armchairs and recline on sofas wanting rain for the sake of entertainment. In the dry the cobbles are risky enough so the rain just makes things worse? Perhaps, probably so even. We shouldn’t want rain because of the risk, craving a Wacky Races aspect is too much. Yet it’s not certain the rain makes things more dangerous, last Sunday’s sunny Tour of Flanders saw many riders crash out while the wet pavé stage of the 2014 Tour de France had its spills but only one abandon in Chris Froome and he pulled out because he had cracked his wrist the previous day and then fell again before reaching the cobbles. The peloton hurtles down slick mountain passes in the rain too. Perhaps the argument for rain is because it’s normal, because it happens and because it’s about time. It rains beaucoup in northern France so a wet edition is overdue and this generation of riders and cycling fans alike have yet to see what it looks like. When Paris-Roubaix switched from its procession to the farm tracks used today in 1968 the race organiser Albert Bouvet feared he’d risk the wrath of the riders and stayed out of their way for a while at the finish before braving the showers. “One like that every year, ok, but not two” was the verdict of one rider as he washed the mud away. Similarly why not one wet edition for today’s generation? The race is dangerous enough because of the legendary pavé and hoping for rain as a means to increase the risk and spectacle seems wrong. But it’s not certain wet conditions make the race any more dangerous, there maybe be crashes but there always are, just as last Sunday’s sunny Ronde saw too many. The Arenberg Forest is feared any day of the year. What we could hope for is to see the different imagery: no more dust clouds, instead riders caked in mud, bikes clogged with dirt and for a slightly more technical challenge where trajectory and traction count alongside pace and power. It’s strange that we associate the spring classics with foul weather yet Paris-Roubaix has been dry for so many years. Dig into the data and it’s not as surprising as that, statistically this is the driest time of year for the region. During his long career Fabian Cancellara has made a name for himself in this race thanks to his long breakaways. Will he escape the rain? Every year we get a “Gibus” bridge photo. Here’s the opportunity to explain its special significance to cycling and P-R.
What would be best is enough rain before the race to keep the dust down. What’s not frequently understood by viewers is the hardest racing is usually the KM before the entrance to some of the sectors. Unfortunately production crews don’t seem to integrate it into the live story being told very well. Maybe you have another one lined up Inrng, but it’s always worth expressing some worldwide gratitude for the thankless task of refurbishing/maintaining these sectors, 150m at a time. They do a great job and are only a part of the process here to save the roads, they do repairs and take on apprentices to learn the work but there’s a wider push to try and cherish these roads, to stop them from being ploughed up or tarmacked over. As much as we like the race, these are roads people use for the rest of the year and just keeping the cobbles for the sake of a bike race is hard but people appreciate the mining history and more. But looking good for mud, while it might not rain on Sunday, Saturday’s rain might suffice. I think that what is hypocritical is, in this modern world where the senses of self and of achievement, and external attention and validation, are by far the most valued commodities, to put in contrast the poor rider and the spectator in his armchair. The spectator is willing to give away what he/she him/herself doesn’t aspire to. The one in the special situation should want his situation to be as special as possible. For admiration to take place there has to be someone wishing to admire and someone wishing to deserve to be admired. Ad-MIRED. Fear of wet cobbles more dangerous than the wet cobbles themselves? We seem to get the notable crashes largely happening before the riders reach the major challenges of the monuments these days, so the stretch of innocuous tarmac in the run up to the first major cobbled section could be the real danger point. That’s because the fight is on (!!!) to be positioned well for the next potential choke point. The pace is high and the competition to have a good position at that moment is very intense. I am going to be one of those abused hypocritical armchair supporters, and I want to see the race I have payed good money to see. Not some sanitized version of a safe bike race, where if you are not careful you will end up with all the riders arriving at the finish together, to decide amongst themselves who should cross the line first. “After you, no after you”. Look ,I am not advocating anything new in the sport or this particular event, nor demanding blood and gore for my entertainment. BUT this debate is going in exactly the direction that many of us feared, and it is not a good direction for the future of the sport. It’s Paris – Roubaix, not kicking a small ball around on AstroTurf ! Are we seriously going to have H&S discussions along with the associated weather concerns about every bike race. I prefer to talk about the course and the riders, not the course and the possible weather implications ! I can see the logic in eliminating one of the earliest cobbled sections if it is considered far too dangerous, it does after all only carry a level 3 classification. The organizers have already stated that they will review the course condition and convey their decision to the DSs meeting the evening prior to the event. But please, please lets concentrate on the bike race, and not yet another set of hypothetical weather and course conditions. Hypocritical wins over Hypothetical every time ! Where did you pay your money? Did you buy a ticket? Or was it a TV subscription. I will say it boldly, I think you are an armchair supporter, so you have no say in the safety of the competitiors. If you have not ridden those roads or competed in a bike race you have no right to demand anything because you do not understand the risks. If you have put yourself out there then you know what you are demanding. Two boys lost their lives two weekends ago doing the thing they love, but they lost everything in doing so, and you cannot ask others to do the same. Only the competitors hold the right to say if they will risk it all. RQS. As your reply is full of assumptions, aggression, and poorly informed on every single count – I am being extremely polite. I will only give you a short curt reply, which is a lot more than your insulting post deserves. The only point you have correct, is that this Sunday I will be watching Paris – Roubaix from the comfort of a sofa (your armchair). Where I pay my money is of no concern to you, you will just have to accept that I do pay -the clue is monthly and the sofa ! I have raced and lived all over Europe, including racing over ‘The Stones’ on numerous occasions, so your ‘boldness’ is also sadly misplaced as is your comment that I have no practical knowledge of bike racing – that is probably your biggest personal insult. Note that I am NOT demanding anything, simply expressing a view based on experience and the history of this particular event. Good job you got the sofa (armchair) bit right ! Don’t presume to speak for me, or bring into doubt my race, organizational and background experiences. To include the unfortunate deaths of two riders, in two quiet different circumstances, is out of order and totally unacceptable. You should consider retracting this particularly offensive comment. I come to this forum for the generally high quality of the comments and the excellent understanding of the sport shown by the majority of posters. Of course people have differences, but they generally respect other posters and do not insult their views, intelligence and knowledge. You are entitled to your own views. Don’t however make unfounded assumptions and comments on my behalf. So neither short nor curt, just condescending and self important. This is why I visit the site less the last year or two. What used to be an enjoyable and informative place has become quite ugly at times. BC, please take a look at yourself and your tone, for the good of all. Guess he own some expensive armchair. “I paid good money” is downright ridiculous. And by the tone of his last reply, I assume he’s downright trolling. I’m with the others calling you out. You don’t pay anything for cycling. I assume you purchase cable TV or something to justify yourself as a paying stakeholder? Whatever. You use the term “we” a lot when discussing cycling in your post. You are not part of the “we”. You don’t get a say, just as I don’t get a say. And that’s a good thing, as you are consciously baying for blood, it seems. For those posters above. I consider my original post was a reasoned view, following which my knowledge, experience and background was questioned. The ‘armchair’ is rhetorical, in case you hadn’t noticed, so not the object of cost. Troll is the incorrect word for a long term poster, but worthy of a deliberate and unsolicited insult. I have never considered myself important, and nor do those who know me. I simply corrected publicly incorrect assumptions made about me. It is difficult to do that in one sentence and without some detailed comment. If the truth appears condescending or self important you are entitled to your view – it is unfortunately simply the truth. Chris. You are making the same incorrect and unfounded assumptions as RQS. Given the torrent of abuse above, it’s probably best not to respond in any detail, except to confirm that I have a link to team sponsorship, so could be called a stakeholder – although that is not a form of words I would chose. I agree that it is a shame that INRNGS excellent blog has become less attractive because of poorly informed personal attacks. I have never personally attacked individuals, but will defend myself against such unfounded accusations. It would be a much better world if people could simply accept different views, and debate the subject matter rather than the individual. Popcorn eaters can finish their snack, I’m off for a few days to the muddy stones so this is a final comment ! Well said BC. On all of your comments here. As is so often the case, the ‘tone’ of a comment is criticised whilst RQS’s personal comment was what you were responding to – but that is ignored. I particularly agree with this: ‘poorly informed personal attacks’ – a lot of people criticise not the comment, but the commenter. Chris, the fans should have a say – regardless of any financial transactions. A few of the comments that follow, such as ‘consciously baying for blood’ are as hysterical as they are illogical. We all watch bike racing and we’ve all seen that the dangerous aspects of it are not weather-related. Neither of these had anything to do with weather – using them in this way is disgusting. I am sure you two are great guys but I find your posts tedious, petulant and defensive. If Inring was a beautiful beach you’d be there with your stereos blaring away, please turn them off occasionally. This won’t make any difference to your behaviour but there is always an outside chance I guess..
+1. But it won’t stop them. They have many, many opinions that must constantly be shared with everyone, again and again. It’s basically made INRNG only worth reading to where the comments start. Sad. There’s probably as much good commenting on here as ever I think, but there is also the other stuff. I don’t have any statistics (the phrase is echoing in my head) on whether the proportion of “other stuff” is increasing, but surely the total number of comments has increased over time. Safety issues are a particularly poor topic for this forum (and at this time) IMO. Inrng wisely tried to discourage “debate” about it after Gent-Wevelgem, but the lid had to come off at some point I guess. And sure enough, someone “touched the third rail…” I am far from giving up on the comments section (though I feel yer pain, Anonymous), but I had been hoping perhaps Inrng go do a piece on safety which would find some way of foreclosing these doomed discussions. I don’t hope for rain at P-R because I don’t like to ride in the rain myself. But if it rains I might be secretly intrigued, and I’ll still watch. Is it hypocritical if the fan would much rather be out there racing with these guys than sitting in a stupid office filling out reports because I have to feed my family and I wasn’t good enough on a bike to get paid? I did my time when I was young, racing in the snow (I live in Canada), training in rain, etc. I never raced Paris-Roubaix, but if these guys complain or strike or whatever, I’d gladly cross the picket line and race my tail off on those wet cobblestones! I do agree that the mud covered section after the 60kph descent should be moved, but everything else is game on. That’s actually a great idea. You and I could race it and, as we’ll take double the time, there would be double the TV rights intake! That’s how it works, right? The income comes in regardless of who is racing and the riders don’t matter? This nails it. I don’t want to see riders crashing, or even think there is an increased risk, but it’s the black and white mud-caked images of hard men suffering that have helped build the mythology. We did the sportif last year and then watched the race the following day. It rained for the first few hours of the sportif so we hit a grey, foreboding, misty wet Arenberg. Looking down that dark damp tree-lined cobbled ‘tunnel’ with the bridge looming was hairs-on-the-back-of-the-neck goosebumps stuff, one of my cycling highlights. Riding it on a summers day wouldn’t have been quite as magical. Admittedly I did not watch 2002, but Pro Cycling Stats records that there were only 41 finishers that year. The winner Johann Museeuw was 3.04 clear. Looking at pictures of mud-caked riders from yesteryear is all very interesting, and I recall watching football and rugby matches in similar mud baths way back when too, but I don’t want to see it this weekend. If it happens, it happens but wishing for poor conditions is like an inverted blood lust to me. A Coliseum-type mentality to exaggerate the point. Give me a decent day, a fair wind, and another cracking race like De Ronde. What an beautiful last line. I didn’t see that one coming, inrng. Chapeau! I wish for a good, competitive race in whatever conditions there are on Sunday. Pro cycling’s at risk here with all the CYA and weather protocols. The sport trades on EPIC performances under EPIC conditions, otherwise why not race from Paris to Roubaix on the superhighway…but only if it’s sunny and warm? The sport wants the respect and interest (money) EPIC racing creates, but it seems more and more reluctant to provide it, instead trading on the heritage and passion of days-gone-by. At some point that runs out and someone has to create some new EPICS to keep the thing alive, no? It becomes even more ridiculous when you consider the marketing-maven hype about all the “improvements” in bicycles, clothing, etc. if the conditions they can be demonstrated in become ever narrower. Your argument is that the sport seems more and more reluctant to provide “epic” (whatever that means, seems a very subjective term) racing, instead trading on the heritage and passion of days-gone-by. If I’m allowed to understand the term “epic” in the context of the great piece that we are commenting on – i.e. tougher than average racing, on tougher than average surfaces, in tougher than average weather conditions – I couldn’t disagree more. Perhaps I would agree that was where the sport was heading in 2007 or 2008. Now, more than for many years, the sport is trading on “epic”. Cobbles in the Tour, gravel in the Giro, gravel in Paris-Nice, the increasing status of Strade Bianche among riders and fans, and so on. Sports philosophers would agree that entertainment/money and safety are the most important values for event organizers of most elite sports these days (fair play not making it all the way up there). In road cycling, entertainment/money has definitely been taking the upper hand over safety for a long time, with particularly the Giro really pushing it at some occasions. The extreme weather protocol, rider protests etc. is a reaction to that, not an indication of the opposite. And in what way is the sport trading on the heritage and passion of days-gone-by? That is, in what way is this sport doing it more than other sports, to such an extent that it constitutes a problem (which is how I interpret you)? Perhaps some of us cycling geeks who are subconsciously attracted to footage of Mercx or De Vlaeminck could feel that way, but for the great majority history and legend is a very small part of their exposure to pro cycling through mainstream TV broadcasts and mainstream press. It is all about here and now, Sagan, Contador, Sky and Nibali. Surely the marketing people can choose among plenty of epic performances under epic conditions featuring these riders. 1) “In road cycling, entertainment/money has definitely been taking the upper hand over safety for a long time, with particularly the Giro really pushing it at some occasions”. Don’t mistake “safety” with “impression of safety”. Safety is about the actual number of serious accidents and their real circunstances. In recent years, most if not all serious accidents in the Giro (and not only there) happened in stages and situations which most people would deem as “safe” (or as “business-as-usual cycling”). We might start to ask ourselves if the safety troubles *do* lie precisely where we imagine them or, perhaps, elsewhere. As a side note (this is not the “elsewhere” I’m speaking of), I’d love to see all the safety advocates rallying hard for safety *in training*, which I suspect to be the major source of death and injury related to competitive cycling. I’m in the subject, and I observe that there ain’t be half of the institutional worry about that. Yet sure we can’t have pro cycling without training, can we? Outright false, or at least hugely context-dependant. Historical footage has been introduced by Italian TV both as an independent show and as an insert during the live broadcasting of “modern” races themselves. And Italy constitutes a significant part of the general public of cycling. The TdF stage presentations on their website often include a lot of references to historical cycling. PS Note that I quite agree with what you suggest in yout first paragraph, even if I’m brought to think about it being more about marketing winks than a real openness towards the epic component. Regarding your references to sport philosophy, I’m no expert but I AM married to one so I get some knowledge in this field by osmosis and proof-reading the books she’s published, but this is far from the forum to debate these issues in detail. Finally (I promise) I have a hard time understanding how “plenty of epic performances under epic conditions…” can occur if stages are not held (as in T-A this year) or cancelled mid-race (as in P-N this year) or races rerouted to avoid challenges like mud (the subject here) or so-called “danger” (as in the Giro’s Crostis fiasco for example, though that was awhile ago) as the first applications of the “extreme weather protocol” have come into play. When CYA becomes Rule #1 it’s a slippery slope. First of all I am sorry if my comment was provocative or in other ways worthy of “wows” and appologies to the rest of the readers. That was not my intention, and I will try again. I would also like to point out that with my reference to sport philosophy, I did not imply anything about your knowledge in the field. There are a few disagreements between us that I still, after reading your and Gabriele’s posts, believe deserve discussion. I will try to make my point clearer. 1) Is cycling more reluctant to provide epic racing (I’ve offered my interpretation of the term above, of course a different interpretation could alter the argument)? I don’t think so, and I stick to the list of races provided above to back up that argument. To me, a small number of cancellations (I, as well, would rather be without them) does not change that. Of course we have to see how that plays out in the future. 2) Is cycling trading on heritage and passion of the days-gone-by INSTEAD of showing a willingness to provide epic racing? Mark the “instead” and please accept my appologies for making this a black-and-white matter of whether or not cycling is trading on history. Reading your comments and accepting the fact that the Italian coverage is quite different (and, it sounds, more attractive even to me, if I only knew Italian!) from what I’m used to (English-speaking and Scandinavian), I see that it is about the role of history, not the “amount” of it. The way the TdF refers to history in its presentations is a good example: Isn’t that about putting the racing of today in its historical context? Producing and re-producing myth and legend? Telling us that when Sagan wins in Flanders, it should be understood in the context of the race’s history? It is certainly not about – at least I very much doubt that it is the intention – giving “aged” audiences a taste of the epic racing that the sport no longer provides. Fair enough, though while I was watching Eurosport just an hour ago a promo came on for Paris-Roubaix. “130 Years of History!” “One Trophy!” they wrote on-screen while images of bygone editions were shown. Riders covered in mud, crashing, bouncing over cobblestones, etc. If pro cycling’s going to trade on these legends and epics, they need to keep delivering them rather than cancelling, rerouting, etc. every time something’s not just perfect. The thing IS called l’Enfer du Nord after all and as someone else here well pointed out, there’s a big difference between uncomfortable and downright dangerous. The 2014 TDF stage showed that the dynamic can change with the rain. Boom won and Nibs and team somehow dropped Canc and co in the downpour. Of course it was a much shorter test than the classic, but the fact that other riders may prosper is enticing. If it’s no longer just about the watts you can put out but also where you can put your bike it’s certainly an added variable to the permutations on the pavé. It’d be great to see how Sagan does in bad weather – I’m guessing he’ll go really well and will show some unreal riding skills. Well, cyclocross champs like Boom and Stybar would become favourites in true muddy, rainy conditions. Sagan can handle his bike in wet very well, but I think physically he doesn’t like cold. He once was mountain-biker, junior WCh, not so fond of cross. Sagan not so fond of cross? The year he won MTB junior worlds he came second in CX junior worlds too. Not bad going to be fair! He was excellent in any kind of cycling he did as a junior, I was talking about preferences. Have a look at the excuses of Lefevre not hiring him 2010: “… he wanted to focus on mountain biking…”. And how many serious injuries occurred when a load of guys who don’t like to ride pavé had to do it in wet, muddy conditions? Similarly, there don’t seem to be a high number of crashes at Strade Bianche, nor were there any on this year’s Paris-Nice gravel stage. People’s perceptions might be that it is less safe, but that doesn’t seem to be based on the reality. Cancellara is no 3rd cat chopper either but I just think the cross boys may have something extra in some of these sectors. If Stybar gets some form he has got the team and pedigree to get a result. Of course there are so many other factors but I think the rain (if it comes) adds intrigue. Sagan has a background in MTB racing and, as DMC mentions, great bike handling skills — I’d expect bad weather to give him an extra edge, if anything. Although, in grim conditions the psychological aspect comes to the fore and might give the edge to the real ‘hard men’ of the sport; Cancellara will be desperate to win a final monument and Ian Stannard has a reputation as a bit of a ‘bad weather specialist’. I guess in this multimedia-connected age, the little mention of a slight course adjustment gets lots of Twitter attention and people worry about ‘the direction this sport is going in’. But what’s really happened is that a road is impassable and the course directors are rightly reviewing the situation. That is all. A bit like MSR. If it rains, the riders will go for it, don’t you worry. They dream too, and this race is a dream for many. +1. Excellent summation of the situation, somebody’s dream will come true on Sunday. Avoid the Troisvilles sector if its wet? No. Im sure pro riders can handle a skating side to side rear wheel by adding more power to the pedals! As to the carnage; it might just be me, but it seems as if there is a lot more of it these days. I welcome the rain and mud (every now and then). It means that a smokey (dark horse) that is likely a mudder (CXer, cyclocrosser) has a chance to get up and not the usual favourites (not that they win all the time). I will be watching on my couch (sofa). Sagan still has a good chance with his extraordinary skills, but I’m thinking Stybar (Etixx will be going all-out) or perhaps Boom. Classic mudders. Reminds me of the Seinfeld episode The Subway. Oh, this baby loves the slob, loves it, eats it up. Eats the slob. Born in the slob. His father was a mudder. His mother was a mudder. His mother was a mudder? I understand the spectator’s appeal of a hard fought race in tough conditions, but we can’t have it both ways: accidents and tragedies will happen in all areas of life, no matter the levels of safety adhered to, whether due to inevitable occasional human error, bad luck, misunderstanding, coincidence of timing, etc. The question is one of balance – how much risk is acceptable? The range will vary between people but what it is important to recognise is, sometimes something terrible will happen. It may be due to an obvious mistake – and “preventable” mistakes can rarely be considered preventable 100% of the time, we are fallible after all – or it may be due to something unforeseeable. Especially in the latter case, the culture of searching for someone to blame, someone to hold accountable, is missing the reality of life that we must accept, while being unhelpful also. It’s just not about risk. It’s not about safety. Blood, gore… blah, blah, blah. All this weather-related talk is only about comfort vs hardhsip. Just that and only that. Pick your side. And if you want to about safety, keep on asking who killed Demoitié, because we should be indignant at not knowing the identity of the perpetrator. I’ll duck after this…. I think Cancellera is an extraordinary cyclist, but I suspect Cancellera doesn’t enjoy the wet. At all. There was a wet slippery stage in the Tour a few years back that he was instrumental in neutralising, the wet cobbles again in the rain in the Tour and he didn’t do what we’d expect. And I can’t remember specifics but I’m sure there’s another couple of times when it’s been wet and miserable and he’s one of the vocal ones about it not being right. As with others it would be good to have a wet one. Not a flood, just wet. This is part of the tradition of the sport and its attraction, and its seems silly to want to race across these roads but draw the line when it’s wet. (After all there’s a difference between skill, calculated risk, and wanton disregard of safety.) And I’d like a wet one if only for Cancellara to show that I’m an idiot and to even more firmly cement his reputation as one of the one day greats. It’s one of the details which mark Boonen as the absolute “cobbles rider”, whereas Cancellara is more of a huge overall engine. Cancellara had two gripes with wet cobbles: (1) according to him, one cannot use a high cadence like when it’s dry, which is what he prefers and (2) they can turn the race into (more of) a lottery when other riders fall down and take others with them. The latter was his particular gripe with the notorious cobbles stage in TdF: the majority of riders were inexperienced unlike in April when the peloton consists of spring classics specialists. I recognise the aesthetic interest of images of mud-caked riders of the cobbles season, particularly at Paris-Roubaix with its industrial history. It all somehow seems to fit this image, as Larry T commented above. But, and this is not a criticism of Larry who has probably forgotten more about cycling than I’ll ever know, life itself in these types of areas was epic back then. I am just old enough to have caught the last vestiges of the manual industrial age, if you like, and I vividly recall images of legions of workers clocking on / off at smoke-belching factories and glowing steel works day and night, labourers and hod carries on building sites in their donkey jackets and wellies, coal merchants caked head-to-toe in black dust, farmers who seemed to us kids to permanently smell of manure. It was the life that people in these areas led, and no-one questioned it as they did it every day from school-leaver to retirement. I’m not from Flanders or northern France but I’m familiar with the life ; the work and the beer that rewarded a day of graft. The sportsmen / women from these areas mirrored this life, and there was as little thought of safety and comfort as there was in its industry. It’s just what you did. It might seem romantic now but it wasn’t. It might seem epic and it was, though its participants wouldn’t have known it. I enjoy reading Inner Ring’s articles for their ability to go beyond the race itself and this piece does that for me. I’m all for the CPA and the Extreme Weather Protocol and such like. That epic life above has all but disappeared and cycling should reflect this. But if it rains or it’s muddy you can pretend, for a day, that it still exists if you wish. Yeah, cyclists are a different breed. Cyclists aren’t a different breed Hahostolze, that’s my point. They’re a product of an environment, like everyone else. Sean Kelly was from farming stock, first job on a building site, in semi-rural Ireland. He would have lived the life I described but replaced a trowel for a bicycle. These races are a product of the environment too ; they’re from another age. Ecky – I don’t think the modern RIDERS are all that different as many (most?) still have a blue-collar background. To me the problem is the FANS have changed – too many white-collar, “new g0lf” types who aren’t interested in the suffering that makes pro cycling what it is, but instead prattle on about all the tech crap important to their “you are what you buy” shopping culture. and note that plenty of them are from the current age. All the riders are hardmen as far as I’m concerned, and it doesn’t need a downpour at Roubaix to prove this. They train in all weathers, day in and day out. Having a riders union, and protocols to protect their interests, isn’t a betrayal to cycling’s roots in my opinion. For those who think it is, get a job on a farm or a building site on a zero hours contract and try a bit of suffering yourself? ‘aren’t interested in the suffering that makes pro cycling what it is, but instead prattle on about all the tech crap important to their “you are what you buy” shopping culture’ – Amen. ‘They train in all weathers, day in and day out.’ – ergo, they can race in them. Interesting that you refer to the Rafa site, Larry T. Perhaps we have found you out to be one of those ‘you are what you buy’ types after all ??????? Sorry to let you down CM, but I’m no fan of Rapha – I found that page solely via an internet search for “Paris-Roubaix quotes” and despite it being a Rapha page, I thought the collection of quotes, including the two I used above to be worth sharing. I wouldn’t own a Rapha product even as a gift. Ecky – I think you’re getting your chamois-all-in-a-bunch here and claiming points-of-view for me that I’ve not taken. Especially your last bits about being against a riders union (I have never been against that, I just laugh at them because they do nothing but talk or oppose things like anti-doping or compulsory helmet use) and my getting a job on a farm. I’m a blue-collar guy myself, a mechanic by trade, though I now am a partner in a bike tour company and have sold bicycles, cars and motorbikes along the way. I DO believe the so-called “extreme weather protocol” is a slippery slope, putting too much emphasis on CYA to the point this discussion was about a Paris-Roubaix course too muddy? If that’s the case, how long before The Hell of the North is stopped altogether because the roads are too rough? The entire thing after all, IS a throw-back to an earlier time! My comments are just general thoughts against the plethora of romanticised-tales and images that we get around these races. What I do find odd, given cycling’s blue collar background, is how the sport is only recently awakening to rider representation. Some obviously feel that this is a good thing. Anyway, we’ve gone a long way down a muddy side-track. It’s raining heavily here, not a million miles from Lille, and we could well see on Sunday how Rapha’s £200 pro team breathable jersey copes with 2″ of best Roubaix clay caked on it! “…plethora of romanticised-tales and images that we get around these races.” are what makes the sport interesting to me. We’ve probably gone way too much into this, but WHAT is wrong with those tales and images? But what you have spoken about is ‘comfort’, not ‘safety’. The weather – except in great extremes: like lying snow – is not dangerous. The EWP has already been involved in one fiasco where a race was cancelled unnecessarily. Racing on wet cobbles was fine in 2002 and 2014 (and all the times before that). There is no safety issue. There aren’t any statistics kept on crashes and their causes, only anecdotal accounts. The EWP is not being invoked at Paris-Roubaix, but is lying mud much different to lying snow? And before anyone has a heart attack, that’s a rhetorical question! ‘There aren’t any statistics kept on crashes and their causes, only anecdotal accounts.’ – precisely. Yet so many on here are commenting as if it is a proven fact that a wet P-R is dangerous. My point, generally, is that we have no evidence to suggest that this is a safety issue. No, you said specifically that “there is no safety issue”. How could there ever be, if statistics are not available? the last time it was wet in 2002, the attrition rate of DNF’s was over 77%. Compared to last year’s dry edition with a drop out rate of 33%. But how many were respective crashes etc is not recorded. Ecky – there should also be a stat on the severity of the attrition rates. For example, how many of the 77% were cold and wet and missed the winning group so they turned and went home vs. had significant injuries. I stick to my comments below about severity of crashes. Add another famously poor weather edition in 1985 to that list, DMC. Or Hinault’s “pigs in mud” 1981 race, with an attrition rate of 77%. Attrition rate doesn’t prove that there were serious injuries. The 2003 TdF first sprint stage had a very low attrition rate, but the 3 guys who were knocked out had serious injuries because the main crash was a high speed sprint crash on dry pavement. And, even worse one guy stayed in the race with a broken neck! So he wouldn’t hit your attrition rate stat, but his injury was far worse than getting stuck in the mud during a wet and rainy P-R.
‘There is no safety issue’ until you can show that there is one. There is also no safety issue with going downhill, sprints or riding in a pack of 200 riders. DNFs show nothing. Except perhaps the fact that when the weather is bad, the riders are uncomfortable and a lot of them – presumably the ones far behind – drop out. Ecky – by the way, you use the attrition rate stat to prove a race is safe, and you said 2015 P-R race was safe because the attrition rate was only 33%. You forgot to mention that about 2-dozen racers skipped through a railroad crossing directly infront of a train! They’re extremely lucky the train had slowed down before getting to that crossing. Further, you could have said that the E3 Harelbecke in 2015 had a similar attrition rate – but the severity of Cancellara’s crash broke his back (potentially because too many racers were still in the race), whereas wet weather attrition is usually riders pulling out. So, as is pointed out by J Evans, attrition rate really misses the point about safety. Selective races with epic weather that make many riders pull out often make for safer overall races because there are less riders to cause crashes. The most severe crashes are in massive groups on dry hot and fast days. JE’s contention is that that there is no safety issue when riding in wet weather and mud. It would be my guess that there are more crashes in such conditions at P-R and that more riders dropped out because of this. – And it is exactly that – a total guess. You are making this contention with no evidence whatsoever. It’s just your personal belief. As I say, there is no safety issue with riding a wet P-R unless you can actually show that it is more dangerous than what the riders normally do in any other race. Otherwise, the ‘issue’ is only one you have imagined. Safety is not the same as your perception of safety. I was shocked it has been so long since a wet race. I have watched most editions since it has been televised and like many remember most of the iconic moments. It’s a great race to watch, and if Flanders was anything to go by, this year might well turn out to be one of the classic (no pun intended) editions. Due to the severity and the length of the cobbled sections in the P-R, luck seems to play a bigger factor here than in other spring classics. Not only with avoiding flat tires and broken components, but staying upright is the challenge. Good luck to all! I will pray for rain – it has been too long and will indeed give another race, with enhanced chances for the likes of Stybar, Boom and Sagan. Of course safety should be considered and if unrideable a section of pavé should be removed, but the race has always been about slippery cobbles (dust can also do this). THE race of last year was Gent-Wevelgem which occurred in conditions (rain and very strong winds) some thought unsafe. The most iconic images of the sport are in bad weather, Hinault in LBL or the iconic Gavia Giro stage featuring Hampsten, Breukink and Van de Velde. Personally I would be scared shitless riding these roads in the rain but that also adds to the perspective of being a recreational cyclist vs being a (pro)racer – I also don’t race ‘normal’ roads as I’m just not interested in the added risk of crashing that a race entails. Having suffered through 3 hours of rain on the 2014 TdF cobble stage at Erry it had stopped raining by the time the race arrived but the cobbles were still slick, it mattered not a jot, the first couple of bunches flew past, only mid pack were they soft pedalling as by that time their job had been done. For my first visit to Paris-Roubaix in 1998 I took my wife and kids and visited some WW1 sites on the way down. Coincidentally these were all close to cobbled sections so I was able to recce them in my 4×4, for which we were grateful. They were wet and muddy 2or 3 days before the event but on the day of the race the 5 that we saw were all mostly dry, apart from Arenberg. The tree cover had stopped the wind drying that section. The bunch gallop up the incline into the first section at Troisvilles was manic with riders jumping the kerbs to try and improve their position into the slight lefthander leading onto the section has stayed with me ever since. Wet or dry it will still be fantastic and with TV coverage starting at 0915 in the UK it might be better than being there. Very non-relevant question but has there ever been a cobbled time trial? I think the Tour included a section on the cobbles in the late 80s or early 90s, perhaps a split stage. Good question. Would make a great stage I think. It’s absolutely fine to hope for rain – even the ex-pro’s commentating do it (Backstedt did the other day). The bit they’re thinking of taking out is the first bit and if it’s clogged with mud then so be it. But it’s Paris-Roubaix and if it rains it’s muddy. Deal with it or pull off after 100km. Or just ride slower. That’s where the safety argument always falls down: if it’s too slippery for you, slow down. I won’t be hoping for rain. If it does rain then so be it, I expect the organisers to look after rider safety and I’m hoping for a hard fought race whatever the weather with no serious injuries (preferably none at all). I don’t race but I am willing to ride in pretty much any weather. I have photos of me on roads covered in ice on my fixed wheel bike (LeMond Fillmore, cracking bike!). I even went up one of the biggest climbs in my local area when the roads were completely iced over. But I could ride whatever speed I wanted, stop when I wanted and I was not surrounded by 100+ other riders fighting for position. None of us expect to be put in a overly dangerous position to do our jobs and riders shouldn’t either. The attitude of “they can ride as safely or as dangerously as they want” is wholly disingenuous to my mind. None of us would expect to be told “Ok, you decide how much risk you want to take, but if you don’t take enough you risk losing your job”. We all expect our employers to provide the safest possible working conditions and professional cyclists are entitled to expect the same. Note that I said safest, not safe. There are differing levels of risk in all walks of life and jobs and there are obviously times where things can become dangerous yet the job still has to be done. Pro riders accept this, every time they ride a bike they put themselves in harms way. It is absolutely correct that they should expect their employers and the race organisers to ensure their safety as much as possible. If that means removing sections of a race deemed too dangerous then so be it. At the end of the day it’s a bike race, that’s all. Whilst we’re at it can we have a snowy LBL, I want to see someone do what Hinault did! And let’s add some snow to the Giro and have the riders stuff their jerseys with newspapers. Followed by torrential rain in the Tour mountains and epic breakaways like Gaul. Then top it off with a Vuelta in 35degree heat. EPIC and PAIN, everything must be EPIC and PAIN!!! I love the history and the sport and those romantic tales are just fantastic to read and see images of. However I wouldn’t want to see Football go backwards to leather balls and mud-bowl pitches. I wouldn’t want F1 to go back to the days of no seatbelts or saftey barriers. I wouldn’t want air travel to go back to wooden bi-planes. I don’t want cycling to go backwards either. The modern sport is different, that doesn’t make it worse. You just have to find your access point to the fun. The environmental conditions aren’t the point in most sports you name (circuit, field, court sports), whereas *they are* in road cycling. Moreover, is what we’re speaking about as dangerous as the majority of the examples you offer? I doubt it. @Gabriele – the weather conditions are very much the point in other sports. The way the games are played changes entirely. You don’t really get this type of thing anymore, not at elite levels anyway. The image and memories it evokes are a large part of the sport’s heritage but these playing conditions were common place in the past. Looks great and it’s become a classic picture. But, unless you were a bruiser that couldn’t run, it was terrible to try and play and train in! What I mean is that they’re the point way less than in cycling… that’s why you play in a definite field (albeit it may be open-air). Cycling is a lot about being tested against different conditions, especially environmental ones. A football team which plays better on a heavy field is a curiosity, if anything, whereas riders are usually talked about in terms of being able to perform in hot/cold weather as a key characteristic of them. Check it in the discussion about Cancellara’s skills under the rain in these same commentaries, above. It’s a bit like the different surfaces in tennis, which indeed form part of the sport (unlike the rain, in that case). No, I believe you’re wrong there Gabriele. The old English football league (pre-Premier League days) started in sunshine and on perfect pitches in August, progressed on a monthly basis via ever-spreading mud patches to an 80% caked heap by January, and ended on hardened bare fields by May. The style of football altered accordingly, less skill, more airborne direct tactics, more fouls, probably more muscle-injuries. The rules and conditions have been changed by the sport’s owners and regulators to rid itself of the *extremes*. And the World Cup in Qatar will have special hot-weather protocols too. Well, at least you’ll acknowledge that the one you’re presenting was probably *one* of the national versions of the sport, the original one perhaps – but I can assure that in Italy the weather in football is seen as something “exceptional”, not as a substantial part of the sport, nor has it ever been. It can make for a “memorable” match, as something peculiar, but it’s not part of the general narrative. Same goes in Spain. In cycling, climate has always been an important part of it, anywhere and anytime. Ecky, this has nothing to do with football – there is no correlation. Personally, I don’t care if they play football on a minefield. No but what happens is that the sports change and move beyond a “hard-man” ideal. For example in football players are now a lot more technical and faster, so playing in mud-bowl pitches isn’t feasible and wouldn’t provide a better show. In F1 the cars evolved beyond the tracks so we got new tracks over time, or update old tracks to suit the new faster cars. Cycling has evolved, it’s less about sheer pain bludgeoning power. There’s also a massively increased following on the road themselves, we’ve all seen the numbers of vehicles around riders these days. In super wet, muddy or snowy conditions they become even more a hazard. I’d argue that cycling shouldn’t be about the environmental conditions anyway. They play a part just like they can in football and F1, but they shouldn’t be the defining factor. Rather it should be the riders skills and strengths and tactical ability. Your wishes would make for a much duller sport. And it would be no safer. Also, the vast majority of races adhere to what you suggest (except that tactical ability is more often than not negated too). What the heck is wrong with the “hardman” ideal? In regard to Gabriele’s comment on weather and football: Gianluca Vialli has noted that as a generalisation Italian footballers have had greater tactical awareness because, training in more benign weather conditions they could concentrate on this aspect of the game, whereas in Britain training in a howling gale does not allow such finesse; you do not stop the training game to discuss niceties in such conditions but rather seek just to keep warm and get through it. So Gabriele may be largely correct in his assessment of the level of importance attributed to environmental conditions in individual matches in Italy but if Vialli is right the effect of Italian weather may have been much more subtle and substantial on the nature of calcio. Ecky is also accurate in his excellent description of the old first division days playing through the changing seasonal ground conditions. Likewise in 1970 it was said that the Brazilians were so great because they played and trained on bone hard pitches and thus developed the ability to pass on the volley and half-volley, which speed of play in turn enabled them to adopt a then revolutionary 4-2-4 team set up. Now with modern pitches Ecky is right that football has become homogenized. So where once the context affected the sport much more, now it does not much. They have to water the pitches to make the game quicker. In cycling the environment has surely always been an essential factor. It has never been just about man and machine against man and machine. Whenever a road goes up or down, or the wind direction changes it is a factor. We all know that cyclists rapidly become sailors – since we work out the wind directions for our rides. A similar but starker example is rowing; just look at last week’s university boat races in the UK –particularly the women’s race. The brutality of that was more down to the wind and tide of the Thames than to the physicality of the crews –and what was satisfying was that the races were decided by thinking through the problem- by which of the coxes was most astute. Safety certainly took a back seat there. For me any demonstration in a sporting event of an acute conceptual grasp by the participants is a fascinating aspect. In cycling over the past several years there have been two riders I would always watch –Cavendish and Contador. In large part this has been because they have been racers –never on the start line other than to try to win. But another of the attractions has been their ability to think in a race. One can’t always see this from the sidelines, of course, but Contador’s feel for a race and its rhythms in particular often has been evident to the onlooker and is a capacity in both riders that can pretty well be taken for granted as a background to the race. I don’t know that a mash-up like Roubaix allows for much subtlety of tactical thinking. Maybe wet conditions are a leveller like they used to be in football. But they may also open the possibility for and accentuate any opportunism that is shown and that is what I would value. Just because someone loves the golden-age of the sport (and it’s not just me and not just me who describes it this way) DOES NOT mean they want to turn the clock back to wooden wheels and leather hairnets. I get tired of the “We must allow cycling to evolve or else go back to 1900” arguments as they’re just BS. The same folks who repeat this over and over would likely throw a tantrum if someone were to suggest fully-faired recumbents, but isn’t THAT letting cycling to evolve? Bike industry “improvements” and so-called evolution can be stopped anywhere we want, it’s not an either/or proposition. In the end ALL sports are created via totally arbitrary rules that all participants agree to follow. I agree to an extent. The current extreme weather protocol seems rather extreme and in the past few years races and stages have been cancelled/neutralised/altered when they really shouldn’t have been. And being more traditional, i.e. racing in extreme weather, is not bad and it can be good to a point. I just know people, and i’ve seen enough Inrng commenters, who would love nothing more than to send us back to the era of wrought iron frames, wooden wheels, dirt roads and no outside assistance. There’s nothing wrong with idolising a “golden era” but some people do need to modernise their thoughts and appreciate the modern sport. ‘i’ve seen enough Inrng commenters, who would love nothing more than to send us back to the era of wrought iron frames, wooden wheels, dirt roads and no outside assistance’ – I’ve read one comment in the whole time I’ve been reading the comments on this website that said anything like this. However, that claim has been made many, many times whenever someone expresses an opinion that is negative towards technology. Being against – for example – electronic gears, radios, disc brakes or time trial bikes isn’t the same as wishing to go back to 1920. People seem to be assuming that those who would like to see a wet race are craving the blood of the riders (blood is mentioned an awful lot above). I suspect only a tiny minority enjoy seeing crashes. But there seems for many this overwhelming – and yet entirely evidence-free – belief that harsh conditions equal danger. We see riders crash and hurt themselves all the time – there is no correlation with the weather. It’s usually sprints, downhills or, most of all, when the bunch is packed together (and seems almost unrelated to speed even). I want to see a wet race because it makes P-R even more the ultimate challenge – yes, I want to see them struggle (and the hardest rider win); that doesn’t mean I want to see them crash or hurt themselves. People imagine that bad conditions must equal danger, but it isn’t based on the facts. I’ve ridden the sportive version a few times. Last year we had a downpour just before arriving at Carrefour de l’abre. It turned the cobbles into an utterly terrifying proposition, the bike was sliding around all over the shop. Guys were flying off the road into the mud left and right. Plenty walked, the edges of the road were a quagmire too. I’m not a professional and I’ve broken enough bones cycling to be scared by this sort of thing…but you have to admire their courage/ability to disengage the fear part of the brain. All of that said, I’m returning for another attempt this weekend! Two premises: I’m generally favourable to the concept of *seeking* riders’ safety, obviously not as an absolute objective but as a result of mediation, negotiation and historical context, too. And: it’s not about the specific sector which might be removed, I really don’t care much about that and it’s probably a fine decision (but I really don’t know since I haven’t got all the proper info). That said, I wonder if when we speak of safety the debate arises on factual grounds or if it’s just about propaganda and the inner politics of the sport (like in: getting a more predictable product, which, although apparently contrary to common sense, is what most sponsors look for). I think I’ve heard a lot of pro and ex-pro riders commenting on Italian TV about the Roubaix being really less dangerous in wet conditions, albeit being hugely harder. More accidents and more serious ones tended to happen, according to these guys’ perspective, in dry races (several reasons were cited as the possible motive). Statistics would be welcome to establish some terrain of discussion, indeed, because – as inrng showed in the past – the pro’s world is full of false myths, too; all the same, I’ve always found quite interesting that the riders’ POV (especially those who used to ride this race as one of the top points in their calendar) was so different from what people might think from an external experience of the race. Obviously, they were insisting so much about this on TV because they knew that people would be surprised and therefore interested (the good ol’ “man bites dog”). In these safety-concious times is it ok to dream of a wet edition? If this race was dreamed up in 2016 it would never be raced. There would be a ridiculous ‘extreme parcours protocol’ or something similar to prevent it. This race is a close as we get (especially when it rains) to the original idea of Henri Desgrange that only one person tough should be able to finish the race. Sometimes old school is the only school. I wonder how much of this incorrect assumption that the weather is an issue is brought on by certain commentators who constantly tell us how awful it will be (in any race) if it rains, as well as incessantly pleading that the riders ‘stay safe’. P-R is one of the safest races if you look at the severity of the crashes. So many of the crashes in P-R involve riders sliding off the cobbles onto the grassy ditches. I’d much rather fall onto grass at 30-40kph than onto dry pavement at 50-60 kph (such as the crash at Scheldeprijs last year in the final 2km at 60kph onto dry pavement). Everyone must remember George Hincapie’s crash when his headset broke off – but he fell onto grass… no harm done at all. I wonder what the stats will show. I suspect they’ll show you that the severity of crashes is much worse on sunny, dry days in a sprinter’s race where if two guys touch wheels many guys fall hard onto dry pavement. I’d much rather fall onto wet pavement and slide off into the grassy ditch. I call for a weather protocol that bans dry sunny days. Racing should be cancelled because there is risk. Latest information from France via the Friends of Paris – Roubaix concerning sector 1 cobbles. Superbe boulet de Troisvilles. Grand Merci. or Great job by the team of Troisvilles. Big thank you. This refers to a large road sweeper/cleaner at present bringing the first sector up to a hopefully reasonable standard. I once rode a sportive that finished in the Roubaix velodrome. It rained all day, the cobbles were slippery as hell but weirdly the most slippery bit was the concrete of the velodrome itself. Like an ice rink…god knows how anyone could sprint on that surface. One funny thing is that it seldom rains on the Tour of Flanders or on Paris-Roubaix, but it often does on the Scheldeprijs, that takes place right in between. It’s 2016. We know now that racing is all about the self-improvement that comes from racing against yourself. So, how does it make sense to do something that might harm you while you’re trying to improve yourself, racing against yourself? Taking unnecessary risks to win a race only makes sense if the goal is something other than self-improvement, like money or the “glory” from beating other people. But, these are archaic ideals about competition, held only by Gen X dinosaurs and their antecedents, who, frankly, need to die off. Speaking of a Gen X dinosaur. Do I have to remind everyone that in 1998 Johan Museeuw ripped open his knee so badly on the sharp pave of the Arenberg trench that, gangrene having set in, he nearly had to have his leg amputated? While it was fairly clear on the day, prior rain had left many sectors, including the Arenberg, caked with slimy mud. Museeuw himself just posted a picture of one of the pave sectors caked in mud and called it “heroic” looking. It’s 2016. The sensibilities of a dinosaur like Museeuw, who’d risk losing a leg to improve himself should in no way govern riders today. There’s a reason history is in the past. It’s the past. We’re smarter than that today, because of the internet. If the Museeuw example is the reason you give why this is too dangerous, then all bike racing is too dangerous. The last really big race – the Ronde – quite a few bad injuries. Also, training is dangerous – e.g. the Giant-Alpecin incident. What we don’t have here is any evidence that a rainy P-R is significantly more dangerous. What we have is a lot of hand-wringing. And it’s the sort of hang-wringing that will ruin the sport because people seem to be saying that it shouldn’t be ridden in the rain. As for ‘We’re smarter than that today, because of the internet.’ Pardon? Is this sarcastic? I honestly don’t know. Besides, Johan Museeuw’s injuries aren’t nearly the worst that cycling’s seen over the years. A few more come to mind, Wouter Weylandt (dry, beautiful weather day), Fabio Casartelli (dry, beautiful weather day), Taylor Phinney (dry, beautiful weather day), Demoitie (dry, nice weather day), etc. The real danger are dry sunny days. We need to hold all races on rainy and muddy courses. It’s always the other people who are writing the bad comments. 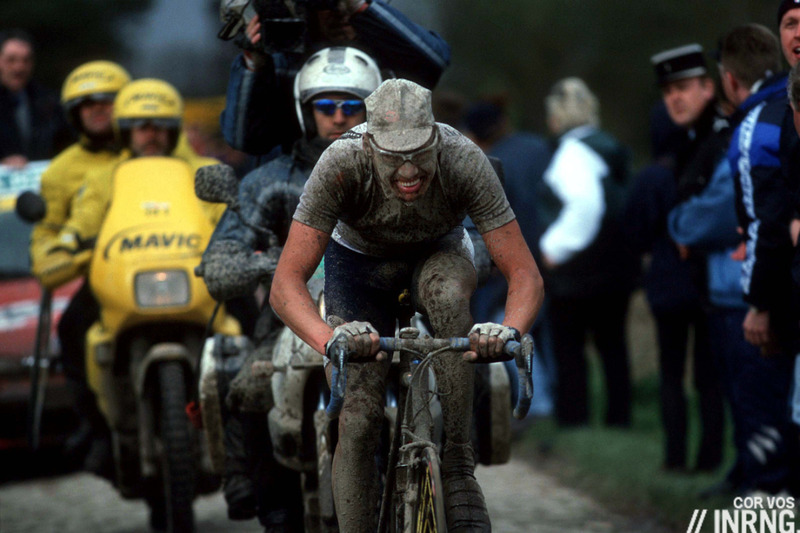 I’d like to see a rain Paris-roubaix, because the pic of the riders with just the skin around their eyes visible through the mud is a classic and it’d be great to see that now and again. Also for the same reason I think we all like to see the course vary a little year to year, it’s nice to have rain then sun. Just varies the races and the racing. Too many comments about comments on this piece… time to turn the comments off here before people start getting more worked up about fellow cyclists.